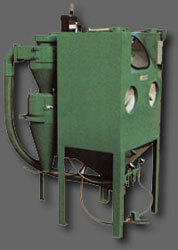 Efficient, versatile, portable unit uses coarse, medium, and fine abrasive and steel shot. Exclusive Vacu-Blast vacuum recovery external blast gun recovers all debris and abrasive at the blast point in a dust-free operation. Two models available. High production, closed circuit system. 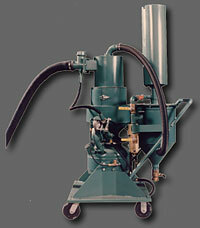 Designed to use coarse, medium, and fine abrasives, also fully capable of using shot for peening. Includes vibrating screen section to keep media flowing smoothly, pressure regulator that controls blasting, dual sight glasses for monitoring media levels, and much more. Optional electric baghouse also available. 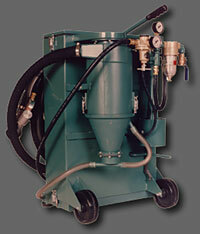 Lightweight, portable vacuum blasting system for use with fine (80 mesh and finer) dry abrasives. Self-contained unit features Vacu-Blast’s proved vacuum recovery external blast gun, ideal for tight-spot blasting and for jobs requiring an extremely high degree of mobility. The Suction Reclaiming Cabinet is a continuous operating blast cabinet and dry honer, designed to clean, etch or finish a surface or work piece. 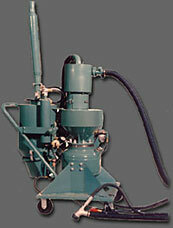 Cleaning is accomplished by a high velocity stream of either fine or coarse abrasive contacting the work piece. Finishing effects are attained by various types and sizes of abrasives. The Pressure Reclaiming Cabinet is a self-contained blasting system using direct pressure to clean, etch, or finish a surface or work piece, by abrasive blasting. 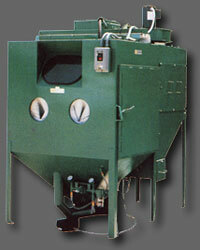 A choise of finishing effects are attained by various types and sizes of commercially available abrasive.